A health probe into the effects of shale gas exploration in Lancashire has been dismissed as a “tick box exercise” by anti-frackers. The county council is to spend £30,000 on examining the likely impact on residents should the controversial drilling process get the go-ahead. But Eve McNamara, from the pressure group Ribble Estuary Against Fracking, accused the authority of “just paying lip service” to safety concerns. Cabinet members will be asked to approve a Health Impact Assessment of two proposed fracking sites near Kirkham – Roseacre Wood and Little Plumpton. The investigation will look at possible contamination of land, water and air quality. A report from the Lancashire’s director of public health, Dr Sakthi Karunanithi, to be presented to the cabinet meeting, says: “It is proposed that work is undertaken to identify information about the full range of potential health impacts. The government is poised to announce that energy firms will be given the right to “frack” under private land without the owner’s permission, according to reports today. It is understood the move will be included in the Queen’s Speech in June – paving the way to avoid any legal block by protesters if shale gas exploration is approved. The legal move would change trespass laws. According to national media reports, energy minister Michael Fallon is set to give more details at a shale gas supply chain conference in Blackpool on Thursday. Gas exploration company Cuadrilla is planning to “frack” for shale gas at two sites in Lancashire – Rosecare Wood and near Little Plumpton near Preston. In the North West the number of residents backing a Greenpeace petition to launch a mass legal block against fracking has reached nearly 7,000, with almost 2,000 in Lancashire alone. A spokesman for the Department of Energy was unable to comment on the reports this morning. Councils that will play a key role in deciding the future of fracking in Britain have investments worth millions of pounds in companies behind the energy extraction method, The Independent can reveal. Local authorities in areas identified as potential sources of gas have holdings via their pension funds in firms seeking to drill within their boundaries. One of the most significant investments is £1.9m held by Lincolnshire County Council’s pension fund in Total, the French company that earlier this year became the first oil major to enter Britain’s dash for shale gas, with a £30m stake in two exploration projects in the county. West Sussex County Council also has indirect holdings in Cuadrilla, which was at the centre of controversial tests in the village of Balcombe last summer. The council also has substantial investments, currently worth £3.5m, in Centrica, the parent company of British Gas – which last year took a 25 per cent stake in a Lancashire shale-gas project operated by Cuadrilla, albeit not directly. The Greater Manchester Pension Fund (GMPF), which invests on behalf of Salford and Trafford councils, holds shares in Henderson Group, a major investor in IGas, another fracking exploration company that is conducting shale-gas tests in the Salford area. All the councils insisted there was no conflict of interest between their pension-fund investments and past or future planning decisions on fracking projects. They pointed out that shares had been bought in all cases except Lincolnshire via investment funds, and councillors involved with pension fund-related decisions did not sit on their planning committees. But campaigners said it sent the wrong signal and called on the local authorities to sell their holdings. With assets worth about £120bn, local authority pension funds are among Britain’s largest investors. Salford City Council said its planning panel members had no role in deciding where GMPF invested its funds. GMPF acknowledged its holding in Henderson Group but said it had no investment, direct or indirect, in IGas. The vast disruption that could be caused across the country by fracking has been laid bare, with the Government announcing it would make 40 per cent of Britain available to companies to explore for oil and gas. Local communities could be subjected to thousands of wells being dug every year in the search for fossil fuels – requiring billions of litres of water, with dozens of lorries passing by every day – after the Coalition said it would put oil and gas licences covering 100,000 square kilometres up for auction. The auction, which would give the licence-winners exclusive rights to explore an area for oil and gas, but would require additional permits for fracking, would add to the 19,000 square kilometres of licences that have already been sold to hydrocarbon producers. Britain’s first fracking site, near Blackpool, was forced to suspend operations in 2011 after being found to have caused two earth tremors. But the Government sought to boost its chances of widespread fracking by saying that next year’s licences, together with those already awarded, could generate almost £1bn for local communities, according to a new environmental assessment of fracking by the engineering firm AMEC. The money would come from a £100,000-per-well payment, irrespective of whether it contains gas or oil, and 1 per cent of any revenue generated – which could be between £2.4m to £4.8m a site. But the Government also revealed that HGV trucks could pass near homes as many as 51 times a day as they travelled to and from the wells. The ferrying of people and materials could continue for up to 145 weeks, or nearly three years, during which time trucks could pass by a given property more than 50,000 times. Launching an environment assessment of the forthcoming licensing round, Energy Minister Michael Fallon said he was “stepping up the search for shale gas” – although he declined to say whether he would allow fracking under his own house. “There could be large amounts of shale gas available in the UK, but we won’t know for sure the scale of this prize until further exploration takes place. It is an exciting prospect, which could bring growth, jobs and energy security,” he said. Anti-fracking protesters have hit back at claims of a multi-billion pound boom for Lancashire if shale gas gets the go-ahead. Greenpeace UK chief scientist Dr Doug Parr said of the UK Onshore Operators Group report compiled by Ernst and Young: “This report is a rehash of rose-tinted industry guesstimates about the economic potential of fracking in the UK. “Paying accountants to tally up hypothetical jobs won’t change the fact that executives still have no idea whether they’ll actually be able to get gas out of the ground on a commercial scale in the UK. “Scratch beneath the hype and this report is actually a veiled plea for government and taxpayer support for an industry that has stalled before even taking off. It’s less about what fracking can do for your country, and more about what your country should do for fracking. Friends of the Earth North West Campaigner Helen Rimmer said: “This report should be viewed with caution – US studies have shown that the fracking industry has exaggerated jobs claims in the past. “Supporters of fracking have form on over-hyping shale gas. Claims that it will cut UK energy bills have been dismissed by most experts. “The North West has some of the best offshore wind and tidal resources in Europe and already over 10,000 are employed in the sector. She said the renewables sector already amounts to £1.2 billion and 10,000 jobs in the North West, with predictions that 400,000 jobs could be created by 2020. Cuadrilla has announced that it intends to apply for planning permission to drill, hydraulically fracture and test the flow of gas from up to four exploration wells at each of the Roseacre Wood and Preston New Road sites. Following submission of its planning application, residents will also be able to make further comments during the statutory consultation period, which will be organised by Lancashire County Council (LCC). Please keep checking back to the RAFF site, as once the applications are received by LCC we will be providing advice on how best to object. Cuadrilla also states that a works programme is also underway to restore the exploration sites at Anna’s Road and Preese Hall. Site restoration plans for these two sites were approved by Lancashire County Council at a planning committee earlier this year. Readers will remember that both of these wells failed – Preese Hall was damaged by induced seismicity caused by the drilling, and Anna’s Road because Cuadrilla messed up the process by getting a packer stuck down the well. As part of Cuadrilla’s review of sites, the company will also be applying for planning permission to carry out seismic and pressure monitoring at its Grange Hill site. The company says that the well will not be hydraulically fractured. Cuadrilla’s plans to frack in Lancashire could be blocked by hostile landowners – despite the offer of benefits that could exceed £6,000 a household for communities living near two proposed drilling sites. The shale gas explorer on Tuesday unveiled plans to frack at two sites near the villages of Roseacre and Little Plumpton, both between Blackpool and Preston, scaling back previous plans to do so at up to seven sites in the region. Francis Egan, Cuadrilla chief executive, told the Telegraph it hopes to commence drilling towards the end of this year and frack as soon as the first quarter of 2015, if it gets planning permission. The two sites could be the first to be fracked since the lifting in December 2012 of an 18-month ban on the practice, imposed after Cuadrilla caused earth tremors by drilling at Preese Hall, just a few miles from Little Plumpton. But Cuadrilla faced immediate threats from campaigners Greenpeace that its plans could be blocked by hostile landowners using trespass laws to deny permission for fracking under their land. Mr Egan said wells for fracking could extend up to 5,000ft horizontally from the proposed drilling sites and admitted that it was yet to secure access agreement from potentially dozens of homeowners under whose land fracking could take place. Under current trespass law, if Cuadrilla were unable to negotiate access with any landowners in its drilling path, it would need to take them to court to overrule them. However, ministers are considering changing the law. Greenpeace said that more than 100 homes in the area had signed up to its “legal block” to deny permission. Shale gas companies have pledged a series of community benefits, including £100,000 for every exploratory well that is fracked, in an attempt to win support. Cuadrilla said that as few as 130 households could receive the “lion’s share” of £800,000 in benefitsthat would be paid if it fracks four wells per site as planned. The Community Foundation for Lancashire has been tasked with distributing the benefits in consultation with local communities. Payments to individual households have not been ruled out, although the cash may be spent on wider community projects. “It’s up to communities to decide that,” Mr Egan said. 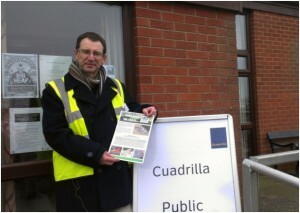 Cuadrilla began consultation with residents on Tuesday and hopes to submit its planning applications in May. Villagers in Roseacre appeared divided over the plans. Heather Speak, 53, spoke of her “shock” at the plans and said people were “frightened”. Cuadrilla said in July it would seek to frack at up to seven sites across Lancashire, though had not begun the planning process at any of them. Mr Egan said it had instead opted to frack multiple wells at the two sites to “reduce the potential impact on the local area”. It could drill wells at different depths “because the shale is so thick”. Cuadrilla encountered fierce protests while attempting to drill for oil in Balcombe in the summer, leading to suggestions from a Tory peer that fracking should take place in the “desolate” north. Mr Egan said the company had “learned from the experience of Balcombe” but denied it had sought more desolate locations.